This is a different spin on the top three vendor rankings visualized in Power BI. 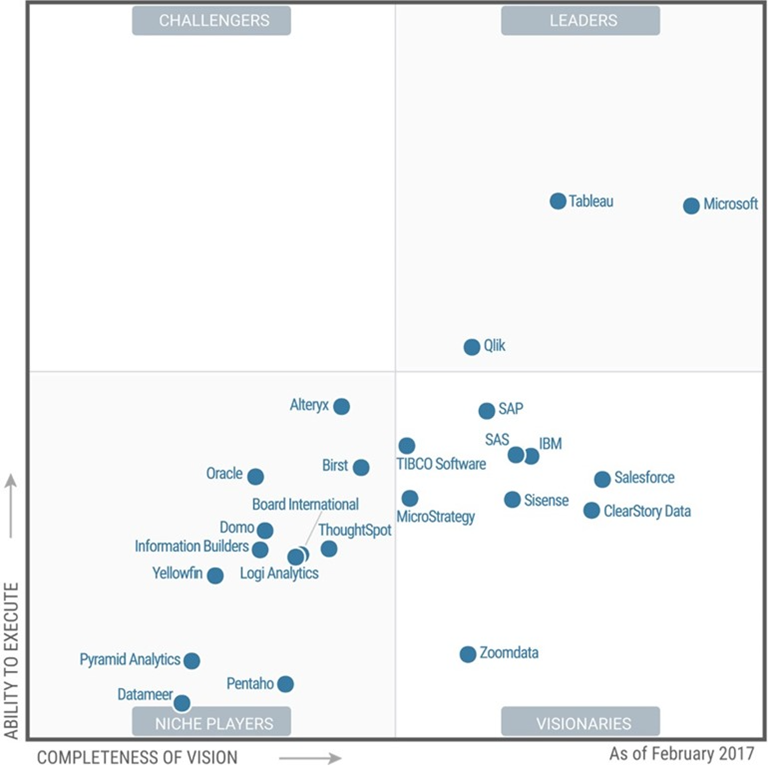 According to the placement of the chart elements in the “Visionary/Leader” quadrant, Microsoft leads Tableau by a little over 36% in the “Vision Completeness “ score and Tableau beat out Microsoft on the “Ability to Execute” scale by just 1.09%. I’ve always wondered just how fine Gartner’s ranking scale is. Disclaimer – I’m simply repurposing the chart image as I explain below and don’t guarantee the accuracy of these results. When the Gartner Magic Quadrant reports are released every year, vendors immediately publish the results (at least those with bragging rights) and a lot of people get excited – especially the marketing and sales people who represent the high-ranking vendors. I’ve always found it so interesting how the Gartner analysts are able to rank and compare different vendors on a seemingly infinitesimal scale, where one vendor shows up just a fractional margin better or worse than a competitor. Here are the results from yesterday’s new Magic Quadrant report for the BI and Analytics platform vendors. As an example, it’s interesting how the bubble for SAS is just a tiny bit higher than IBM. Board International seems to be leading Logi Analytics by a very narrow margin. These comparisons are fairly obvious when the bubbles are in close proximity on the chart visual. The Gartner folks are good at what they do and they produce reams of documentation to back-up these numbers, which I don’t challenge. If you are a Gartner subscriber you can get all the detailed report documentation but the general public usually see the selected bits that each vendor publishes through their own channels, like Microsoft did here. In the BI world, when measuring anything, we talk about granularity, scale and margin of error. When making comparisons, it’s really hard to be perfectly accurate. But, I suppose we could say the same thing about the results of an Olympic race event and if one competitor wins by one-one-hundredth of a second then they are, in fact, the winner. As an experiment, I thought I’d take the top three vendors and visualize the rankings a little differently. Now, please be mindful that my method is not entirely scientific because I don’t have the source data. I simply measured the number of pixels on the Magic Quadrant chart and compared the center position of each bubble. Here’s how the top three looked when I compared the X and Y positions using a graphic editing tool. 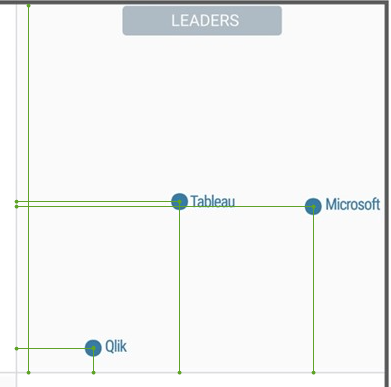 Using the min and max pixel count of the top-right “Visionary/Leader” quadrant, I calculated the relative positions in Excel and then visualized the results in Power BI Desktop. This reminds me, just a little, of the Sprint ad where Paul, the “Can you hear me now” pitch guy who defected from Verizon, says something like “how much more are you paying for a 1% difference?”. 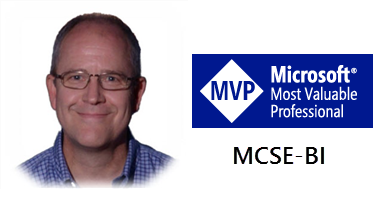 This entry was posted in Gartner, Microsoft BI Platform, Power BI, Self-service BI, SQL Server Pro Magazine, SQL Syndication, SQLServerPedia. Bookmark the permalink. As much I like Power BI but we don’t see much needs in job market (Tableau is much more dominant) even though the report suggest that they very close.